Gurjiwan Brar is an Associate Lawyer at Smitiuch Injury Law. After articling with the firm, he was called to the bar of Ontario on June 26, 2018. He will be working directly for the firm's Principal, Michael Smitiuch, on personal injury matters. During law school, Gurjiwan participated in many extracurricular activities such as the Julius Alexander Isaac Diversity Moot, the Queen's Legal Aid Clinic, the Bystander Initiative, and the Securities Exemptions Project. 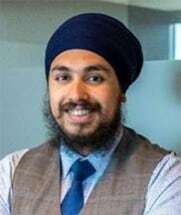 Outside of school, he served on the board of two community organizations and helped organize Turban Up (North America's biggest turban day), drop-in basketball, career development initiatives for high school and undergraduate students and summer camps. He enjoys reading autobiographies, spending time at the cottage, and cheering on the Toronto Maple Leafs.